Missing Teeth? Dental Implants in Fort Lauderdale are the Answer! For too long, you’ve been living with missing teeth, which has been somewhat traumatic. This is because it’s natural for you to have your ivories to chew and digest food and speak clearly. 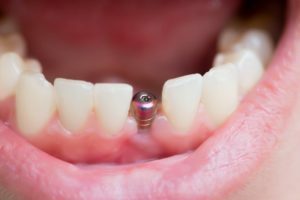 Thankfully, there is a way to end the misery that the loss of your teeth has caused – dental implants in Fort Lauderdale. As you continue reading, your dentist will explain why they are a far better choice than traditional dentures. Dental implants are surgically inserted posts that attach to your jawbone. Usually constructed from high-grade titanium, they act like the roots of your teeth and provide the stability you’ve been missing. Because titanium is a biocompatible material, it eventually fuses with your existing bone to form a solid foundation. The main difference between dental implants and dentures is the support that your entire facial structure receives, because implants go to the core of your facial stability – the jawbone. The denture process is far less invasive, though, which means the level of support can’t compare to that of dental implants. The latter goes beneath the gums, while the former just sits on top of the gum line. This is also significant in the growth of new bone material, because your jawbone depends on the tension provided by your teeth gently pressing against each other. It also relies on the pressure of your roots or implants being fused with it, which tells it to produce new bone cells. No Slipping or Sliding – One of the problems with dentures is that they tend to slip or slide while being worn, which can be quite embarrassing. When you choose an alternative, like implant-supported dentures, you’ll enjoy the security of knowing that your dentures are fastened to sturdy-made implants, using either snaps or a bar that securely attaches. Better-Tasting Food – You’ll enjoy better tasting food when wearing implants because they won’t cover your palate like dentures tend to do. Ability to Chew Better – Want to properly digest your food? Thoroughly chewing it is essential for that to happen. You’ll be able to do that with implant-supported dentures. Longevity – Another benefit of dental implants is that with the proper care, they tend to last longer than traditional dentures. Do Implant-Supported Dentures Cost More Than Traditional Dentures? The cost of the placement of dental implants and then the dentures that fit them will typically be more than traditional prosthetics. It’s important to keep in mind, though, that although implants cost more upfront, in the long run, the durability of their construction and your ability to care for them properly make a huge impact on costs. This is because implants and the dentures they support can sometimes last for a lifetime. If you have other questions about the implant procedure or want to regain the confidence of a beautiful smile with dental implants, then reach out to your dentist in Fort Lauderdale today! Originally from the South Florida area, Dr. Marc Mingel earned his dental degree from Tufts University School of Dental Medicine. An expert in performing complex implant procedures, he helps patients fully rejuvenate their smiles at Mingel Dental. Dr. Mingel can be reached for more information through his website. Comments Off on Missing Teeth? Dental Implants in Fort Lauderdale are the Answer!